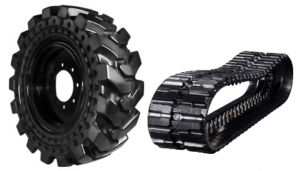 Roadrunner Rubber can help you save money with our quality rubber tracks and solid skid steer tires! With our tracks and tires, you know you are getting the best deal and all common sizes are always available! And we’re one of the few companies to offer a polyurethane solid tire for skid steer operations!